The 2010 mercedes benz e class electric vehicle qualifies for a federal tax credit of up to $7,500, effectively reducing the net base price. Luxurious, prestigious and dynamic, the Mercedes-Benz E-Class has firmly entrenched itself as the definitive mid-size luxury sedan and hopes to do the same with the all-new coupe. Available in rear- and all-wheel-drive layouts, and powered by an engine lineup that ranges from a 268-horsepower V6 to a pavement-punishing 518-horsepower AMG V8, the 2010 E-Class lineup gets a major redesign that puts it a cut above the rest in what has become one of the most competitive segments in the industry. 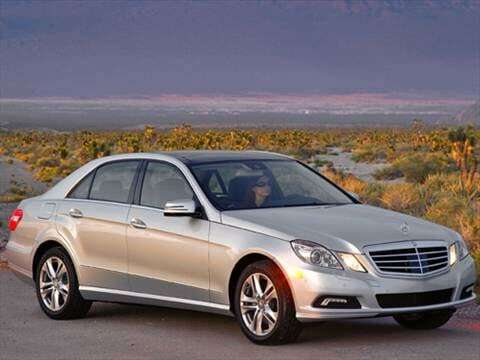 The 2010 Mercedes-Benz E-Class remains the category's easy choice for those that prefer making a more stately arrival. Plus, the E-Class now offers more standard features than ever before. If driving a Mercedes-Benz isn't as important to you as spending thousands less for a similarly equipped vehicle, you may be better served by competitors from Infiniti, Lexus and Cadillac. The entire E-Class lineup has been revamped for 2010 and offers more standard features than previous generations at a lower cost. The E-Class Coupe replaces the CLK in the Mercedes lineup. Stately and luxurious don't have to mean boring. Case in point: The new E-Class. Compared to more sedate E-Class offerings in the past, the new generation is markedly sportier on the road. All E-Class variants offer a suspension that adjusts individual shock absorbers either based on road surface and driving styles or at the whim of the driver. This translates to a firmer, more stable feel when cornering, and a softer, more relaxed ride on the highway. Pair the variable suspension with sportier transmission shift mapping, and you've got a car that is far more engaging to drive – especially in E550 Coupe form, where you also get a more reactive throttle when in "sport" mode. Mercedes' optional Distronic Plus Safety Package comes with Brake Assist Plus and Pre-Safe Brake, which use radar to warn the driver of an imminent collision and modulates the brakes to slow the vehicle down to minimize injury and damage. The Sport Package is more than just bigger wheels and a contrasting interior color palette; it also includes a lowered sport suspension that delivers notably livelier handling. Inside the 2010 Mercedes-Benz E-Class you'll find a tasteful mix of leather and wood, comfortable seats and straightforward controls placed within easy reach. Standard MB-Tex leather-like seats, hand-polished wood trim, metal and black soft-touch surfaces give way in Sport models to burl walnut trim and leather upholstery. Sedans offer plenty of front and rear head- and legroom, while Coupes are best suited for front passengers unless you're transporting children or short adults in the back. Trunk space is more than adequate for a weekend's worth of luggage for the whole family, and seats fold down 60/40 to accommodate longer items. The new 2010 E-Class Sedan takes its exterior styling cues from the 1953 "Ponton" Mercedes sedan, while the Coupe borrows classic elements from the 1955 S220 "Ponton Coupe." Muscular rear fenders and wheel arches give both cars wide, imposing stances. Concave and convex surfaces feel modern and look sleek, while gemstone-like twin-headlamps update the E-Class Sedan's signature front end of four chrome lamellas and an upright star on the hood. In back, Luxury Sedans come with oval exhaust outlets, while Sport models get coupe-like square-shaped pipes and an athletic rear diffuser-look. The Coupe builds on the E-Class' design cues and updates the traditional wedge coupe shape by removing the B-pillar for a smoother, sharper look. Up front, two lamellas surround an inset star in the grille and jeweled, cubist headlamps. Standard equipment highlights include a seven-inch LCD screen that displays radio, Bluetooth and video information, an eight-speaker six-disk CD/DVD audio system with auxiliary input jack, sunroof and a full complement of safety features that includes nine airbags, electronic stability control and Mercedes' Pre-Safe system that prepares for an impending accident by tightening the seat belts, adjusting the front seats and closing the windows and sunroof. Some of the notable options available on the 2010 Mercedes-Benz E-Class include a Sport Package, Distronic Plus with Pre-Safe Brake System, Parktronic with Parking Guidance and Night View Assist Plus with pedestrian detection. The E-Class can also be equipped with a panorama sunroof, rear-seat entertainment system, Drive-Dynamic multi-contour driver's seat with massage, and a choice of Premium Packages filled with comfort and technology features. The Mercedes-Benz E-Class' engine lineup includes three engines: a 268-horsepower, 3.5-liter V6, a 382-horsepower, 5.5-liter V8 and a 518-horsepower 6.3-liter V8. All engines are mated to a seven-speed automatic transmission with optional manual shifting, while the E63 gets an AMG Speedshift transmission that offers rev matching and Race Start. 2010 Mercedes-Benz E-Class pricing starts with a Manufacturer's Suggested Retail Price (MSRP) of just under $49,500 for the E350 Sedan, while 4Matic all-wheel drive adds about $2,500 to the bottom line. The E550 Sedan starts around $57,000 and can top out around $79,000 when fully loaded. The E350 Coupe comes in just under $49,000 and the E550 Coupe starts around $55,500; adding options easily puts that number closer to $70,000. At the highest end of the E-Class spectrum sits the E63 AMG, which will set you back nearly $88,000. To get the best price on your E-Class, be sure to check the Fair Purchase Price on kbb.com before visiting your local dealership. The E-Class qualifies as the priciest lineup in a category that includes the Lexus GS, BMW 5 Series and Infiniti M – which both perform slightly ahead of the E-Class in terms of resale value. The E-Class' resale values remain equal to or better than the Audi A6, Acura RL and Cadillac STS. After 5 years I still love this car! BEST CAR BEST LOOK !!! I DROVE SO MANY CARS BUT WHEN IT COME E CLASS IS SOMETHING ELSE I LOVE IT!! !